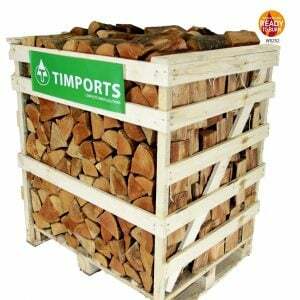 Kiln dried ash logs from Timports is a good all rounder. With the largest crate available you get more logs for your money. Normal (seasoned and wet) firewood logs are 35% less calorific than our kiln dried hardwood logs. It means that if you wanted to heat average size house you would need 10-15m3 for a winter, when at the same time you would use 6.5-10m3 of our professional kiln dried firewood product. Also our kiln dried hardwood logs are much cleaner than normal logs and minimize stove and flue problems. Approx. 8%-13% External Moisture Content. Moisture Content In the Middle Below 20%. I have use many different suppliers in the past,I wasted my money with most of them, I could not be happier with the logs from Timports. Ollie ,the boss I think, is a pleasure to deal with , he could not be more helpful. I recommend Timports to anyone I meet with a woodburner. I won’t be going anywhere else now.